Our delicious Kesar Halwa is specially prepared with the greatest care to ensure customers satisfaction. Prepared from the high quality desi ghee and pure ingredients, it is well known for its yummy taste and genuine quality. We are committed in ensuring that the products are stringently prepared in every level, right from the start till the product is packed and delivered to our esteemed customers. 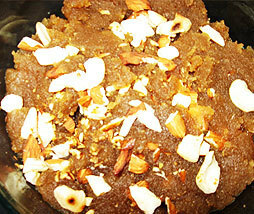 Kesar Halwa is made of sugar, flour, kesar and ghee.